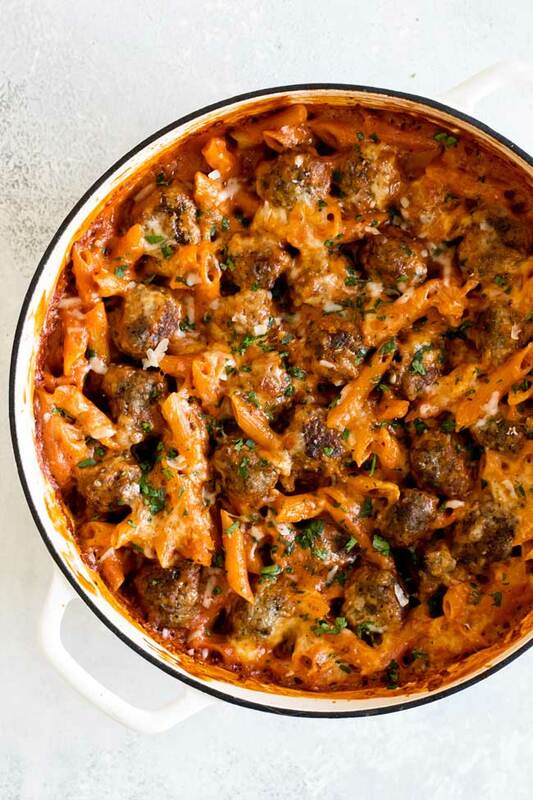 Hearty, comforting, and easy-to-make this one-pan baked penne rosa with meatballs is perfect dinner for a cozy night in. 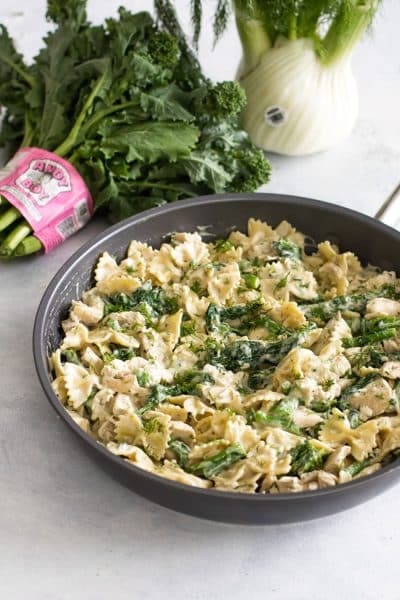 This post and recipe is sponsored by Babblebox.com of behalf of Bertolli®. Seeing as it’s pretty much the dead of winter complete with days of sub-zero temperatures I think the best way to show love and comfort is with pasta. A one-pan baked penne pasta dish, to be more specific, with savory meatballs and a tangy and creamy sauce that you don’t have to make from scratch. 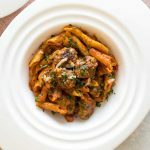 And with Valentine’s day around the corner might I suggest this hearty baked penne rosa with meatballs? 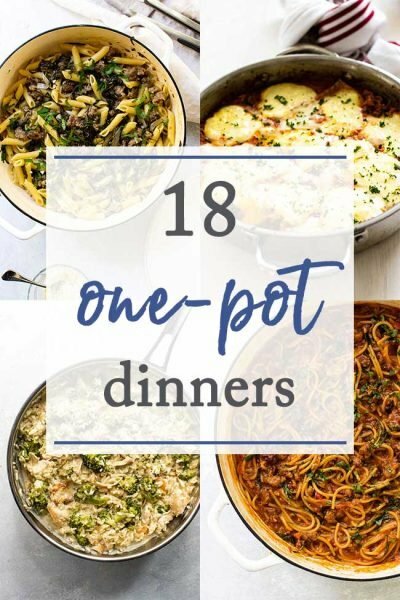 Whether you’re celebrating with your Valentine or your bestie or ignoring the whole day and opting for a night of Netflix staying in for the night to enjoy a cozy dinner is always my choice and you can’t go wrong with a plate of pasta. 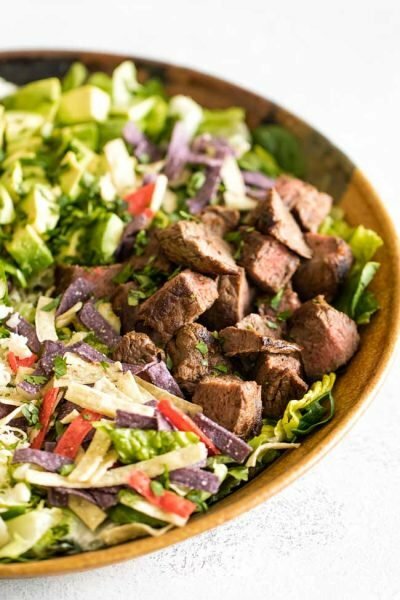 For me, and I am a bit biased because food is my love language, a pan of tender pasta coated in a velvety sauce trumps a box of candy or bouquet of flowers in my book. I often lean on jarred sauces, but they are not all created equal. 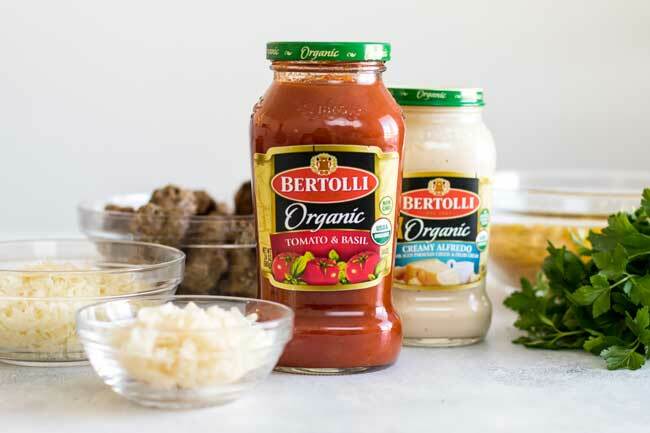 I want something that tastes homemade so to make the rosa sauce I used Bertolli® Organic Traditional Tomato & Basil Sauce and Bertolli® Organic Creamy Alfredo Sauce. When you combine the two premium sauces you get a rosa sauce that has a bit of tang that is balanced out by some cheesy creaminess. 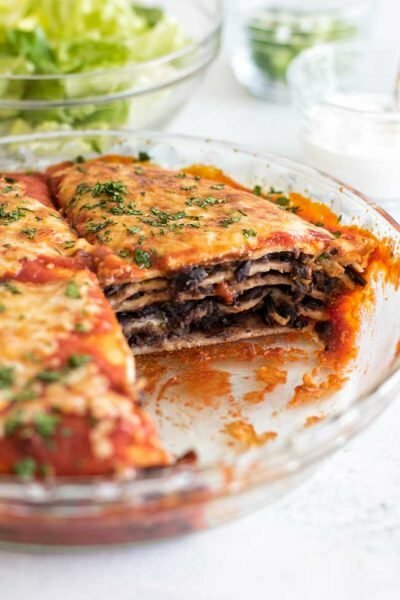 Both sauces are made with non-GMO ingredients and there are countless ways to combine the two for easy dinners (I’ve linked some other recipes ideas at the end of the post!). 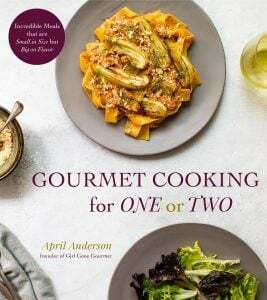 For this recipe, I used both to create a one-pan baked penne. The pasta cooks in the sauce while it bakes in the oven. 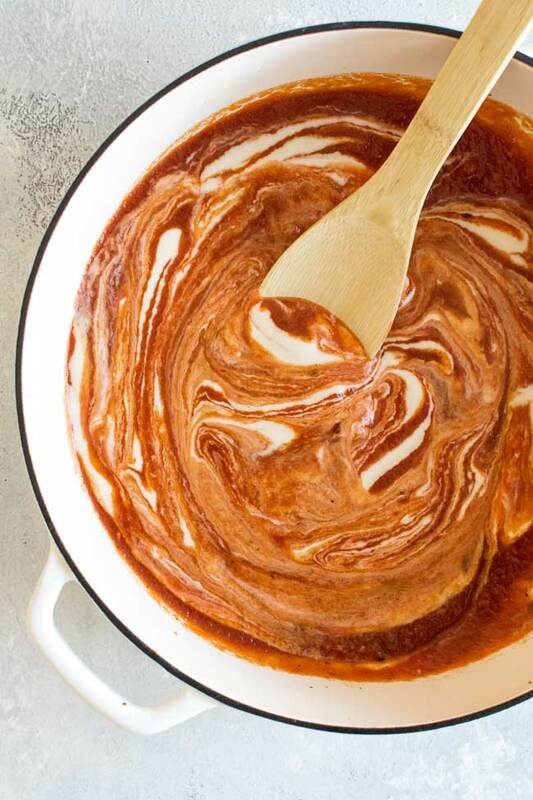 No need to drag out multiple pots and pans and it’s as simple as pouring the sauces into a pan and stirring. It starts with some simple homemade meatballs that are light on the prep work. Combine eggs, dried breadcrumbs, Italian seasoning, onion and garlic powder, and salt and pepper with ground beef. Form it into meatballs, brown them in a large pan and they are ready to go. Everything else goes into the same pan you use to brown the meatballs. 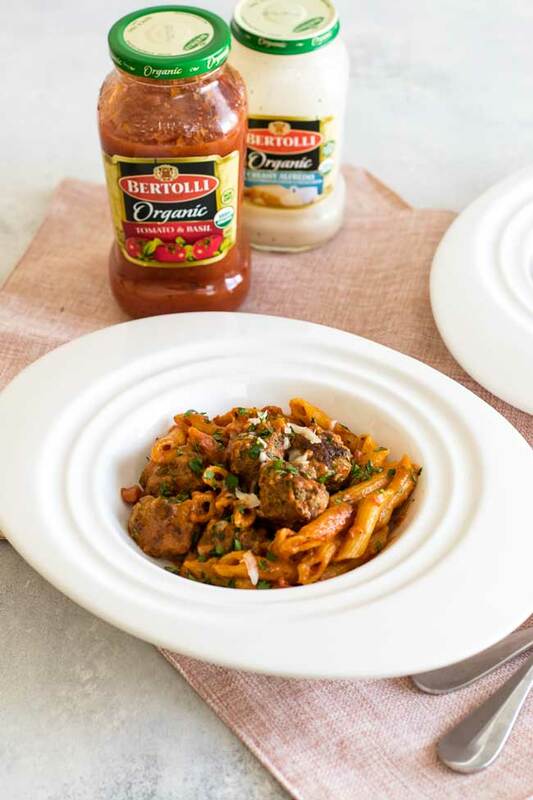 First, combine a jar of Bertolli® Organic Traditional Tomato & Basil Sauce with a jar of Bertolli® Organic Creamy Alfredo Sauce. Bring the sauce to a simmer and add the uncooked penne and stir to coat it in the sauce. Add the meatballs, top it all with some shredded mozzarella and Parmesan cheese. 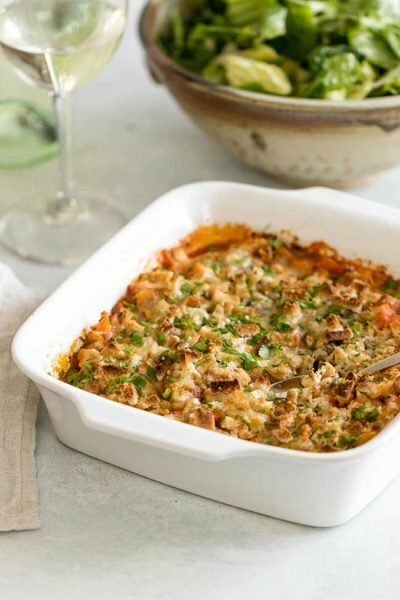 Pop it in the oven and about 30 to 40 minutes later you’ll have a cozy, hearty baked pasta dish.